Being on a ten-day vacation is a lot different from being on a fifteen-month hiatus. One is more tired, it’s hard to get into a rhythm, and you’re so busy trying to cram in as much as possible (at least I am–I’ve never been a sunbathing and Mai Tais by the pool vacationer) that it is hard to find time to blog. So we’re already behind. I’m writing about events of four days ago. When we were planning this trip, we realized that British Airways points (Avios), which we earn with a credit card, could be used to purchase vacation activities. Although in theory one collects Avios to book reward flights, we had learned from an earlier experience that this is far than ideal, since you still have to pay taxes & fees (not insignificant on an international flight) and you cannot change or upgrade your seat, regardless of what you are willing to pay. So booking vacation adventures (and thus feeling like you were getting them for free!) seemed like a better choice. We picked out two adventures for the Avios we had. 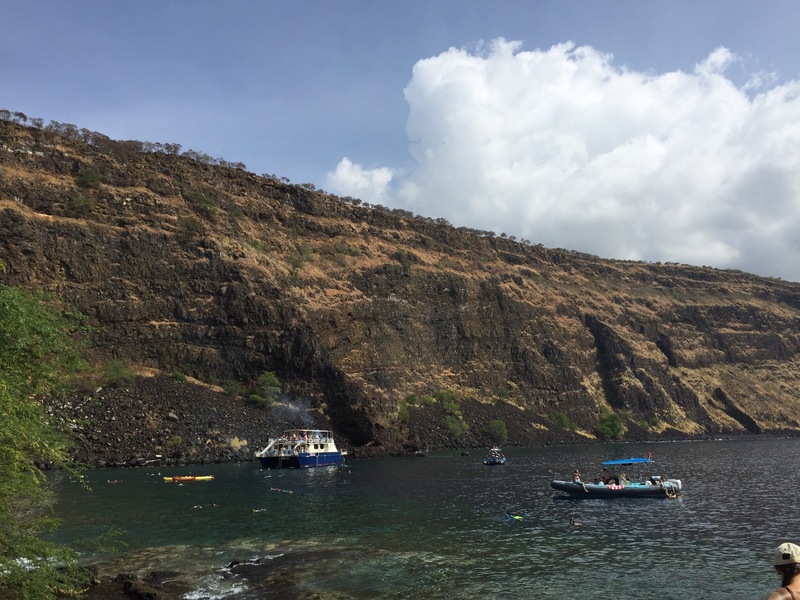 The first was Saturday’s outing–a dolphin, kayak, and snorkel adventure in Kealakekua Bay. (I read carefully to make sure it was not a “swim with dolphins” tour, and learned that the dolphins are wild and seen only from a distance.) Booking the excursions is a bit Priceline-esque, you know what you’re booking, but not with whom until after you confirm. Only three companies have permits to do the trip we chose, so we knew it would be one of them, all of which are pretty highly-rated. We ended up being booked with Aloha Kayak. We were instructed to meet at their shop in Honalo at 8 am on the day of our tour and to wear swimsuits and shoes that we didn’t mind getting wet. When we arrived, our guide Jamal had us sign waivers and then distributed snorkel gear. The only other participants were a Chinese couple from Los Angeles, though tours can have up to 12 kayakers. Next, Jamal gave us a little history lesson about Captain Cook and Kealakekua Bay. Apparently, there was once a community of about 25,000 people living around the bay. Captain James Cook was a prolific cartographer who had explored Australia and New Zealand and circumnavigated the globe before visiting Hawai’i. On his third visit to Hawai’i (and second landing at Kealakekua Bay), a dispute arouse over the theft of a small boat after Cook’s ships were not-so-graciously received by the locals. Negotiations turned to fighting and Cook was killed. A monument–on British land–now marks the spot of his demise. Note: we did not have a waterproof camera or a method of protecting a camera or phone from water, so our photos of this adventure are limited. Next we had to trek (in our cars) down to the starting point of the trip. It was about a twenty-minute drive down a windy mountain road. 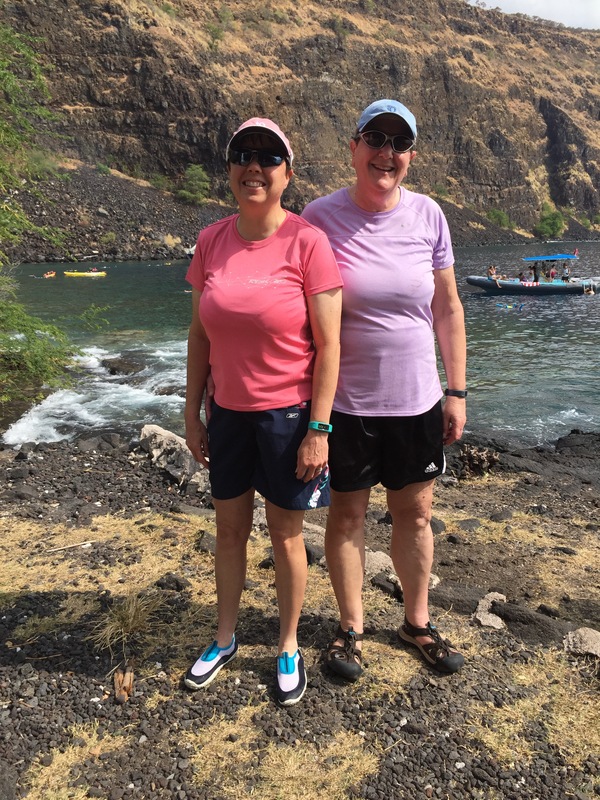 We entered our tandem kayaks from a concrete wall with some steps. Luckily Jamal had a steady hand and water shoes with some grip. The paddling was a pretty good workout. We could see the monument as soon as we entered the bay, but it was 1 and 1/2 miles away. We took our time getting across, stopping to rest and to look for spinner dolphins. We saw a small sub-pod, but they were being “pursued” by some human swimmers, so we didn’t get to spend much time viewing them. Jamal seemed disappointed that we saw so few, but we were happy to see some dolphins jumping and spinning. We continued across and followed instructions for the somewhat tricky landing near the monument. Next up, snorkeling! Our tour-mates generously shared some Japanese snacks–candy and a cheeto-like crisp. 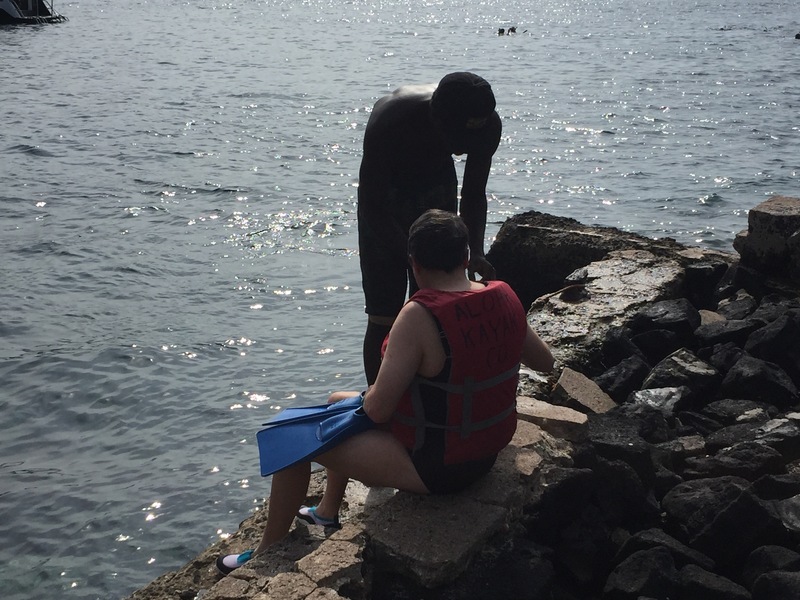 Then we donned snorkel gear and boosted off a wall into 5-foot-deep water. 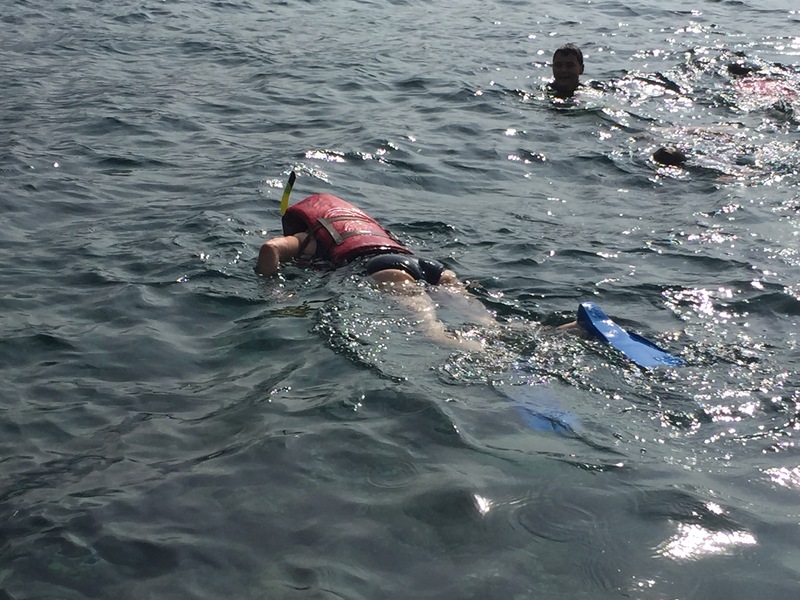 The snorkeling was amazing. The water was extremely clear and we were just above a coral reef, which drops off a little ways out into the bay, much like the reef in Finding Nemo. There were no Nemo-fish, but many yellow Tangs, black Durgons, Butterflyfish, Wrasse, Eels, Sea Urchins, and more. I swam much more than I expected to and only returned to shore when the water got crowded with humans from the many snorkeling tour boats that idle nearby. We walked back to our kayaks, noting the many mongoose (an invasive, human-introduced species) nearby, then reversed the entry maneuver to regain the Bay. The trip back was harder, as we had to fight the tendency of the sea to pull us away from shore and our eventual destination. We saw a few more dolphins along the way, but mostly just paddled steadily back. All in all, it was a lovely trip, and Jamal was an informative and supportive guide. If you get to Kona, pack a waterproof camera and some paddling chops and go for it!